State board member Brad Oliver, left, shakes hands with Gov. 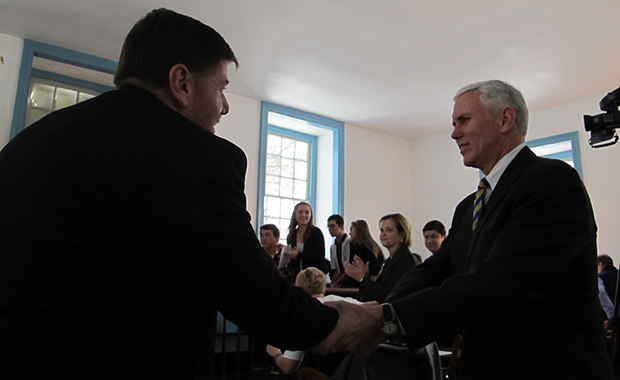 Mike Pence as he makes his way toward the podium to deliver a speech at Indiana's first state capitol in Corydon. Gov. 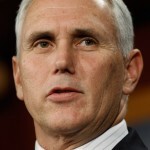 Mike Pence would rather state lawmakers create a state-run preschool program targeted toward low-income families rather than a program for which all of the state’s children would be eligible. “The evidence of success of universal pre-K is rather mixed,” Pence told reporters on Tuesday after a speech in Corydon to outline his education agenda. The leaders of the Indiana Senate’s Democratic caucus announced in September they wanted the state to create a universal preschool option. Pence proposes to create preschool vouchers for families with incomes of up to 185 percent of the federal poverty level. The top Republicans in both the Indiana House and Senate have expressed willingness to pass some kind of preschool legislation this session. Other key lawmakers, though, have expressed skepticism. Pence didn’t provide a price tag for the program — and some concerns over the cost of pre-K cost have derailed previous proposals. The governor’s agenda as it pertains to education is one that provides the need for both credit and concern… decades of study show that the results of early childhood education are in fact, not mixed. The varied results the governor speaks of are a direct result of a failure to fully commit to early childhood education.